Revenue in the Luxury Fashion segment amounts to US$39,239m in 2019. The market is expected to grow annually by 1.5% (CAGR 2019-2023). 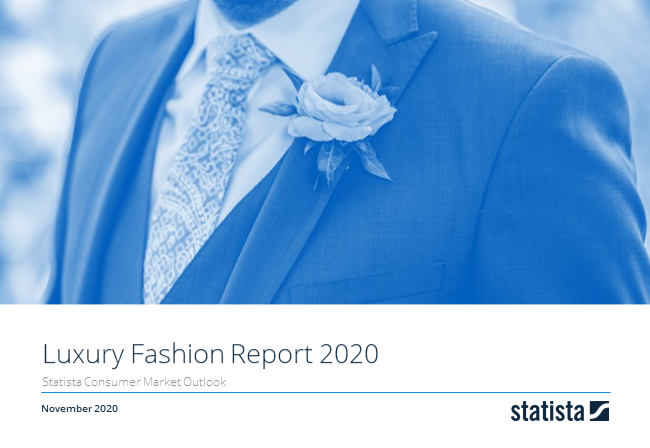 The market's largest segment is the segment Luxury Apparel with a market volume of US$28,769m in 2019. In global comparison, most revenue is generated in United States (US$25,046m in 2019). In relation to total population figures, per person revenues of US$51.88 are generated in 2019. The Luxury Fashion segment includes Luxury Apparel and Footwear. The overall definition of this segment follows the Consumer Market Outlook’s Apparel and Footwear markets, while here only sales of luxury brands are considered, and mass-market products are excluded. Fashion constitutes the bulk of sales in the global personal luxury goods industry and has a healthy growth outlook over the next five years. The shown market data are based on an analysis of more than 100 of the biggest luxury companies in the world. A complete list of all companies and brands covered can be found in the methodology description. Accordingly, fashion goods from smaller companies or artisanal production unaffiliated with the companies covered are not included. All data are shown at retail value, which includes markups for retail distribution and sales taxes. The most notable companies are LVMH (with brands such as Louis Vuitton, Fendi or Loro Piana), Kering (Gucci, Balenciaga, Saint Laurent and other brands), Ralph Lauren and PVH (Calvin Klein, Tommy Hilfiger). Reading Support Revenue in the Luxury Fashion segment amounts to US$39,239m in 2019. Reading Support The Luxury Fashion segment is expected to show a revenue growth of 1.6% in 2020. Reading Support The average revenue per person in the market for Luxury Fashion amounts to US$51.88 in 2019. Reading Support With a market volume of US$25,046m in 2019, most revenue is generated in United States. Here you can find more studies and statistics about "Luxury Fashion".